Find hotel near Adichikkavu Sree Durga De .. Located in a small village Pandanad, this ancient temple is another beautiful religious site to visit in Alappuzha. This temple is said to be the most ancient temple in Pandanad and it is dedicated to Goddess Durga. The striking feature of this temple is its ancient Kerala style artwork crafted on the walls of the temple. The major festival that is celebrated over here is Pathamudayam. It is celebrated for 10 days. Here, Pongala is celebrated by women. Even a 9-days festival is held where the visit of the Devi in the homes of Pandanad is celebrated. Visit the temple during one of these festivals. How popular is Adichikkavu Sree Durga Devi Kshetram? People normally also visit Chavara Bhavan while planning their trip to Adichikkavu Sree Durga Devi Kshetram. Adichikkavu Sree Durga Devi Kshetram, also known as the Adichikavu (Adichicavu) Devi Temple (Malayalam: അടിചിക്കാവ് ശ്രീ ദുര്‍ഗ ദേവി ക്ഷേത്രം) is one of the oldest temple in Pandanad village, Alapuzha. The temple is located at Pandanad in Chengannur taluk of Alappuzha district in the south Indian state of Kerala. The temple is situated about 6 km west of Chengannur, and 4 km east of Mannar. 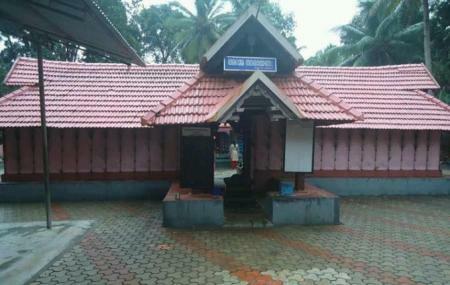 Another great Durga temple situated in Chengannur . Amazing architecture and a great place to worship for the devotees of goddess Durga.The place is commonly visited by Hindu as a part of their religious customs and offerings. If you are not an hindu it is not must visit place.